The average individual office worker uses up to 10,000 sheets of paper every year, and 15% of those paper documents are misplaced. Another 7.5% are lost completely. That said, one of the best things you can do in your workplace this year is reduced paper waste. Consider the following practical tips you can use around your workplace to reduce paper waste. Many office workers like to print out emails to have them in paper form. Yet, printing out unnecessary documents such as single-line emails can cause significant paper waste. Rather than printing out unnecessary documents or copies, ask yourself (and your office workers) first if what you're printing absolutely needs to be printed. You'll save yourself a surprising amount of paper by doing so. Many offices across the U.S. are choosing to go paperless. Electronic document management systems make it easier for office workers to access the files they need and to forward important documents to those who need them without making dozens of copies. What's more, electronic document management solutions make it so you can view both older and newer versions of the document so you can be aware of what's changed without printing out many copies. Electronic document management services can be great for going paperless, but sometimes you do need to print out certain documents to have in paper form. Managed printing services give you the ability to keep printing under control in your workplace. You can reduce unnecessary printing and even reduce your workplace's energy use by reducing how many printers and copiers your office uses. By reducing your paper waste and limiting the number of printers in your space to the ones that are better optimized, you can actually improve your office's efficiency. Want to prevent unnecessary printing expenditures? 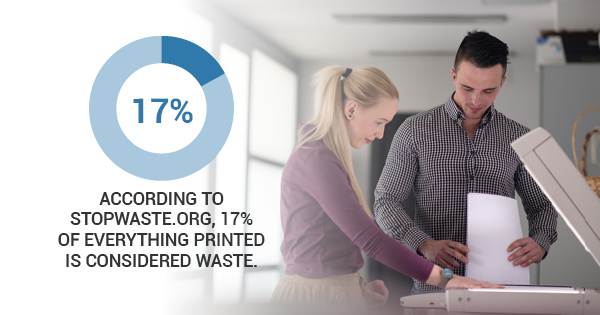 Up to 17% of everything that's printed is considered waste, according to StopWaste.org. This is a major financial loss considering the average employee's printing expenses cost companies between $600 to $1,300 every year. Fortunately, you can prevent unnecessary printing expenditures by investing in managed print services. With managed printing, you have control over who can print from where and what gets printed. To learn more about managed printing services and how to prevent unnecessary printing expenditures, contact A and B Business Solutions today.